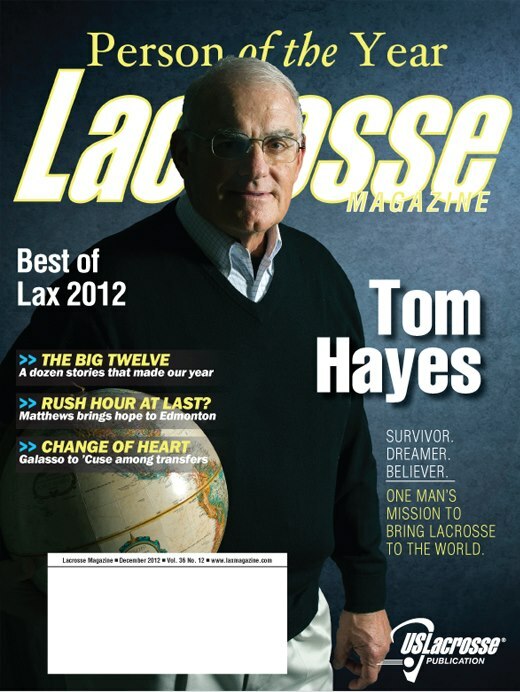 Twenty-nine years after he was left for dead on the side of New Jersey’s Route 42, Tom Hayes engineered the biggest development in lacrosse no one’s talking about — acceptance into SportAccord — and remains the galvanizing force for the global lacrosse community. The Big Twelve: Are you pro- or anti-shot clock? That’s a loaded question in the lacrosse world. Pace of play tops our list of the 12 biggest lacrosse stories in 2012 — the good, the bad and the ugly. Best of Lacrosse 2012: Lacrosse Magazine recognizes the players, coaches, teams, games and moments that shined above all others in our sport this year, while LaxMagazine.com fans weigh in with their picks. Big Is In: After a surprising run to the Champion’s Cup final, Edmonton scored 6-foot-4, 230-pound phenom Mark Matthews at the top of a beefy NLL draft class. Has Rush hour finally arrived? What We Did: As the calendar turns to 2013, here are 10 big things US Lacrosse membership helped USL achieve for the sport in the past year. Your Edge: Get positioning tips from goalie Zach Oliveri, feeding tips from Jasmine DePompeo, coaching tips from TJ Buchanan and Charlie Obermayer’s take on the new NCAA rules. The Scoop:A once-promising career for Nicky Galasso went south when they no longer had room for him in Chapel Hill. Now he’s headed north and bringing his talents to Syracuse. Plus, a look at other big offseason transfers and the 2012 National Lacrosse Hall of Fame induction ceremony. 2012 recap: The Stealth had some debilitating early-season injuries and dug a 1-5 hole when coach Chris Hall returned to the bench after receiving treatments for throat cancer. Washington never bounced back. Offseason: Forward Cam Sedgwick and transition man Jason Bloom, the team’s captain, retired. Defenseman Kyle Hartzell was traded to the Wings for a draft pick. Transition man Chet Koneczny went to Colorado as a free agent. Entry draft: The Stealth need to get younger and faster on defense. Veterans will be pushed by No. 11 pick Tyler Garrison, a 6-foot-2 and 200-pound defenseman who was captain of the Coquitlam Junior A club in British Columbia, No. 12 pick Bill Hostrawser, an aggressive checker who helped the Orangeville (Ontario) juniors win the 2012 Canadian title, and No. 19 pick Justin Pychel, a 6-foot-1, 210-pound defender from the Six Nations senior side. Coaching change: Dan Perreault is in and Dan Stroup is out as coach of the offense, and Bloom becomes an additional assistant coach. Goals: The only players with more than 20 goals last season were Lewis Ratcliff (36), Rhys Duch (33) and Athan Iannucci (21). If Jeff Zywicki isn’t hampered by injuries like last winter, and if Iannuccci thrives during a full season with this team, the offense should be much better. New captain: Defenseman Kyle Sorensen takes over from Bloom. Schedule: The Stealth opens Jan. 5 at home against defending NLL champ Rochester. 2012 recap: The Mammoth went 11-5 in the regular season with the most potent attack in the NLL. John Grant Jr. won the scoring title, setting an NLL single-season record with 116 points, and it looked like Colorado was bound for glory — not a 14-10 home loss to Minnesota in the first round of playoffs. Having forward Gavin Prout (calf muscle) and goalie Chris Levis (groin) at less than 100 percent did not help. Nice mix: The Mammoth has plenty of options, as seen in the numbers of its top five scorers last year. Grant (50 goals), rookie of the year Adam Jones (29), Jamie Lincoln (27), Sean Pollock (26) and Gavin Prout (22) led the way. Offseason: Colorado signed free agents Rich Morgan and Chet Koneczny. Morgan is an NLL giant at 6-foot-8 and 260 pounds. Koneczny is a hard-nosed defender. They were two of the most prized free agents and general manager Steve Govett landed both. Morgan was with Minnesota the last three years and has played defense most of his career, but Govett wants to try him up front to set picks for Grant. Ironically, it was a big hit from Morgan that sidelined Grant for two games with a broken sternum in 2012. “We wanted the team to be grittier so we went out and got Morgan and Koneczny,” Govett said. Dalgarno returns: Forward Joel Dalgarno, who took 2012 off while establishing a firefighting career in British Columbia, will help make Colorado’s offense the most diversified in the league. Big Mac attack: Mac Allen missed the first half of 2012 while rehabbing from a knee injury, but should be ready for the start of the season in January. A full season with Big Mac is a big boost on the back end. Colorado ranked sixth out of nine teams in defense last season and must improve in that area if it wants to win it all. Crease competition: Govett signed Toronto castoff Matt Roik to compete with Levis and Tye Belanger for the starting goalie job. Roik won an NLL title with Washington, and it was a surprise when the Rock released him fter a three-game losing streak last winter. Govett doesn’t believe Roik is done. Schedule: Colorado opens at home Jan. 12 against Washington. Ready to defend an NCAA championship for the seventh time in eight seasons, head coach Kelly Amonte Hiller and Northwestern Lacrosse announced today (Nov. 26) NU’s regular-season schedule for the upcoming 2013 campaign. The slate features 10 matchups with NCAA Tournament teams from a year ago and seven home dates at Lakeside Field, including a March 30 rematch of last season’s national title game against Syracuse. Amonte Hiller, a five-time national coach of the year with a career coaching mark of 196-30, is looking to steer the Wildcats to an NCAA-record ninth consecutive trip to championship weekend next May. Coming off their first MCLA national championship since 2006, the Colorado State Rams have announced an ambitious and challenging schedule for the 2013 campaign. In addition to featuring eight teams ranked in the Nike/Inside Lacrosse MCLA Coaches’ poll at the conclusion of last season and seven teams who competed at the MCLA national championships in May, the schedule will include seven grueling back-to-backs on either Friday/Saturday or Saturday/Sunday throughout the year.